We mangies love our pepper. It is one of those spices that is used world over, that can be sprinkled over almost everything. Pepper (Miri in Konkani) is one of the major intercrops grown in Mangalore. Hence you will also find here many pepper based dishes. Dishes like Pepper Roast, Pepper fry, Chicken/Mutton Pepper Curry are common adornments at most family meals. You will also find combination of pepper with other spices like cumin (Jeere-Miri) in the preparation of meat like chicken and beef, another popular combination is pepper with garlic (Losun-Miri) goes well with fish (lepo/ sole fish), prawns and vegetables (field marrow/ mogem, lady fingers/ bhendi , and gherkins/ tendli. 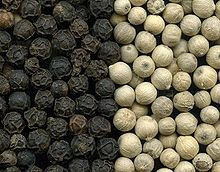 Black pepper originated in Kerala. 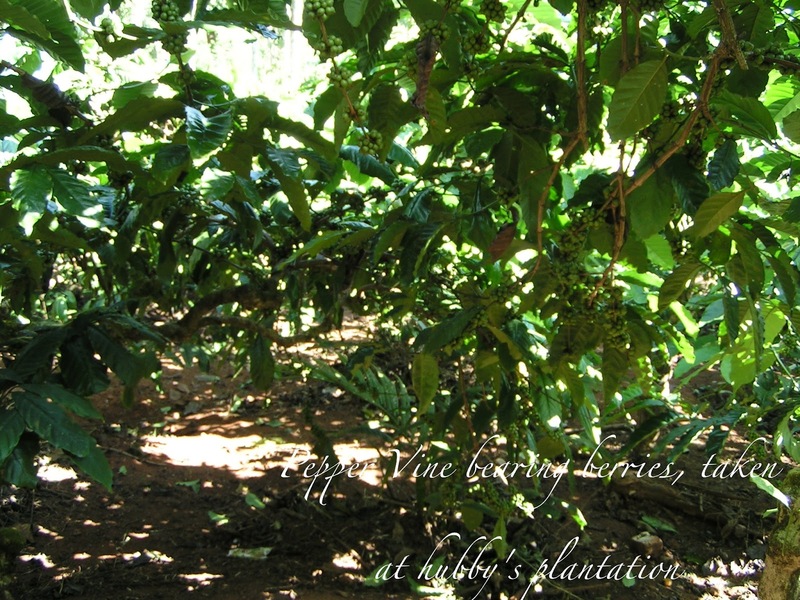 From here it spread to the rest of South and Southeast Asia where it became an important spice plant. Once used as currency and presented to the gods as a sacred offering, peppercorns are the fruit of Piper nigrum, an evergreen climbing vine. Black, white, and green peppercorns all come from the same plant, but they are harvested at different times and handled in different ways. To make black pepper, the clusters are plucked when they are not quite ripe. They are then left in piles to ferment. After a few days, the berries are spread out on a mat and left to dry in the sun for two or three more days until they are shriveled and nearly black. To make white pepper, the berry is picked fully ripe. Its outer shrunken skin is rubbed off, exposing the dried, grayish-white pepper inside. White pepper has a milder, more delicate flavor than black pepper, and is useful for adding a peppery flavor to light-colored sauces and soup without adding the black color. White pepper is popular in European cuisines and is more expensive. Pepper has a wide variety of medicinal applications. Ancient herbalists used pepper especially to treat runny nose, and also to treat hemorrhoids. Recent scientific investigations indicate that the piperine in white and black pepper may act as antidepressant-antioxidant, protecting cholesterol from changes that lead to calcification and formation of atherosclerotic plaques. Antiproliferative, preventing spread of cancer cells. A pain relief agent even stronger than capsaicin. 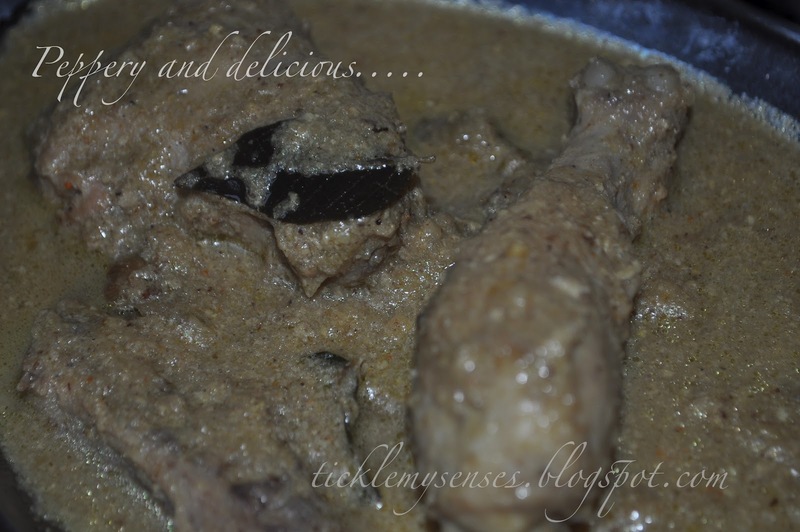 With so many health benefits, there is no reason why you shouldn't treat yourself to this delectable curry. This is my mom's recipe for a Pepper Curry. Baby chicken: 3 or chicken with bones weighing around 2 kgs. 1. Roast pepper corns till fragnant, add whole cloves, poppy seeds and sunflower seeds roast for a few seconds. Put into a blender, add turmeric powder and little water to make a smooth paste. Empty marinade into a large bowl. Add yoghurt, turmeric, lemon juice and salt to taste (a little extra). Marinade chicken for minimum 2-3 hours or overnight. 2. In a large vessel take oil, add cardamom, fry till fragnant, add curry leaves and slit green chillies, fry till green chillies turn white, add the chopped coriander leaves and fry till they wilt. 3. Add the pureed onions, sprinkle over it a little salt to hasten cooking, fry well on a medium flame till oil seperates. This step will take at least 10-15 minutes. Once the onions appear to be clumping together and leaving the sides and bottom of vessel well, is an indication that onions have cooked. Not following this step properly can leave you with a bitter taste in the curry. 4. Next add the marinaded chicken pieces one by one into the vessel. Let the marinade drip back into the marinading bowl for the moment. Make sure you place each piece flat on the floor of the vessel, that way each piece will fry evenly. Fry the chicken on a hight heat for a couple of minutes till lightly browned. Add oil if needed to stop burning of the spices. Turn over and seal the other side. Finally add 2 cups of water to the marinade bowl. Collect all marinade within the bowl and add to the cooking vessel over the chicken. Using a wooden spoon make sure you loosen all the fried spices at the bottom of the vessel. 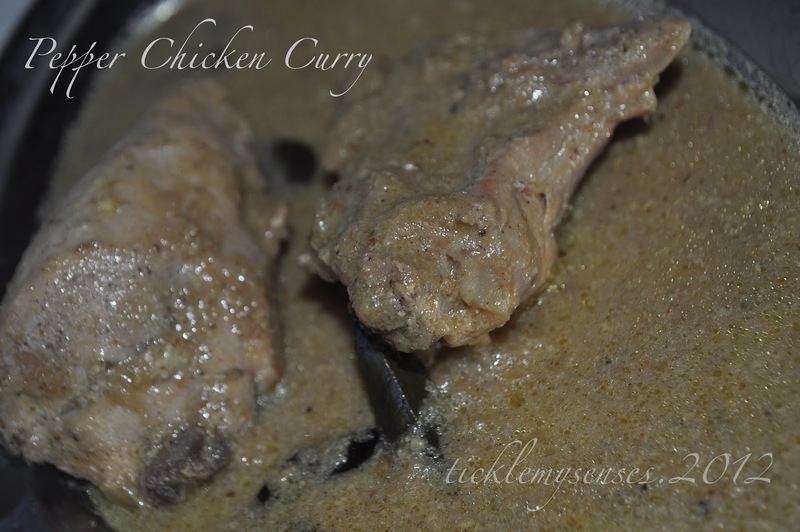 Sprinkle over a teaspoon of chicken stew powder. 5. Cover and cook on low medium heat till done. Once done adjust the consistency of the gravy, check the salt, squeeze over half a lemon juice, bring to a gentle boil. Turn off the heat. Sprinkle over freshly chopped coriander leaves. 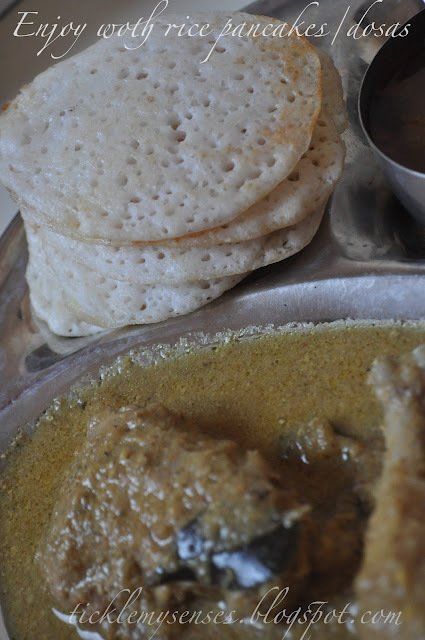 or serve with appams, neer dosa/panpole or simple white rice. delicious and yummy pepper chicken.. i always like the addition of pepper in chicken recipes..
HI Carol Since poppy seeds are banned in the middle east what do you think we can substitute that with? Cheers!! and Thanks for your wonderful recipes. You could substitute poppy seeds with cashewnuts. Use around 5-7 cashewnuts. They need not be roasted before grinding. Hope that helps. Do drop me a line to let me know how your curry turned out. A much-loved and much-missed dish. Thank you!